Taman Remaja Surabaya leisure entertainment facilities are modern, complete and sophisticated is provided by the manager of the amusement park "Warwick Amusement Group Indonesia". One of them is Taman Remaja Surabaya represented by PT. Star Taman Remaja Surabaya, which are on the road Kusuma Bangsa, with an area of ​​16,910 m2. By the age of more than 30 years, Taman Remaja Surabaya more professional in dealing with the performance of each facility and arena games available. This is to improve the safety and comfort for visitors who want to enjoy the entertainment and recreation in Taman Remaja Surabaya. 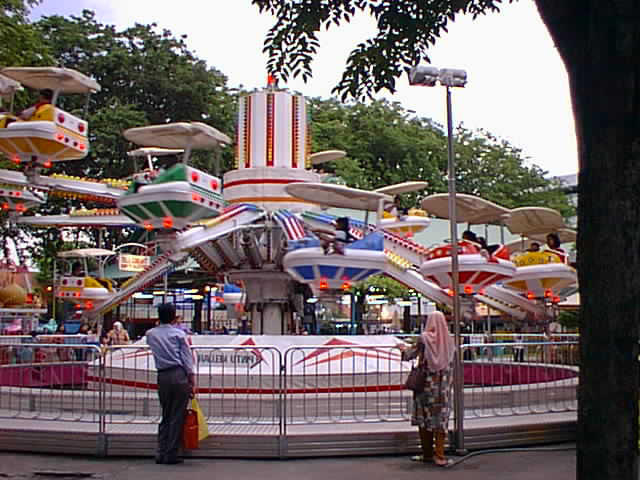 In large areas such Taman Remaja Surabaya provides several facilities including 16 games of children and adults, the attraction of the game machine / Fun Fair (Boom Boom Car, Ghost House, Shooting Gallery, Merry Go Round, Twin Dragon, Twist Aldin, Mini Train, Ball Pool and so on). There are also 2 Stage Entertainment (Main Stage and Stage Garuda), where you can enjoy musical performances and Jakarta feat local artists in various musical genres pop, hop hop, R & B, dangdut, rock and so on. And there are interesting at this stage entertainment, the event: skill performance in the transsexual toilet, singing and waddle in the event transvestite show. To enjoy the culinary, there are 4 cafes and restaurants (Melody Cafeteria, Rainbow Cafeteria, Youth Ice Cream, etc.) which served good food menus Indonesian Food, Chinese and Western Food. And there are also a variety of soft drinks, ice cream, fruit juice. With the location of cafes and restaurants are spread evenly so that provide convenience for those who want to rest and serving food and beverages. There is also a public facility outlets photography, souvenirs, small mosque, medical aid room, public telephone, parking areas, toilets and office information. Taman Remaja Surabaya provide something very interesting, cheap, fun and satisfying for the visitors. Taman Remaja Surabaya open on the day, Monday through Friday, hours 15:00 to 22:00 pm. For Saturday and Sunday (and Holidays) open hours 9:00 to 22:00 pm. If you are still curious (to prove), it's complete address: Jl. Kusuma Bangsa 112-114, Surabaya. kayanya seu jalan jalan ke sana,.! !